Maybe, finally, a replacement for Art of the Mix? Lowering transaction costs = more small entrepreneurship opportunities. A good read, provocative as always, from Chris Anderson. The flip side of this is that on the financial side, smaller lenders = less readily available cash = constraints to getting new businesses started. Using the Redirection plugin with regular expressions–some quick examples. I used this to fix a big chunk of my old blog archives that were 404ing after my blog consolidation. Buffer overflows–not just for criminal purposes. A buffer overflow in a Zelda game can be exploited to load an “arbitrary code” channel on your Wii. Just a quick housekeeping note–over the weekend my hosting provider finally consolidated my www, discuss, and wp.www.jarretthousenorth.com sites onto one machine. You can go ahead and head over to www.www.jarretthousenorth.com now. With this consolidation, my Manila blog is finally no more. I cut my blogging teeth on Edit This Page and the other features which at the time were state of the art, but which didn’t move as fast as the revolution they spawned. Jarrett House North became a WordPress site last year, but the old version of the site lived on at two different web addresses — which didn’t help my Google presence at all. Now, though, you can find me at www, discuss, or wp.www.jarretthousenorth.com and it will all be the same site. I have a few broken links to fix, so bear with me. I have to mention in passing that I highly recommend the superb Redirection plugin for finding and fixing 404s on a WordPress site. A sobering, even frightening exploration of vulnerabilities in the way most browsers and OSes interact with proxies can be exploited to pwn an HTTPS session, stealing and altering supposedly secure data. Must read. When I first read about this, I totally missed that the subway car MOVED. I just thought it was a small, lame repro. My bad. Grab bag: Negotiations of various kinds. An interesting policy tradeoff — I wonder which “major lawsuits” are being dropped to get this to move forward. Responses to security audits range from the funny to the sad. Author Tim's BookmarksPosted on May 19, 2009 Categories linkblogLeave a comment on Grab bag: Negotiations of various kinds. Handy checklist to determine whether a work is in the public domain in the US. Nicely executed. Missing only a few details (astronaut dummy with donut) to join the police cruiser atop the Great Dome as one of the great all-time hacks. Exploring some of Google’s new search options a week ago bore surprising fruit, as I discovered enough about the first named conductor of the Virginia Glee Club, Harrison Randolph, to write a Wikipedia article about him. 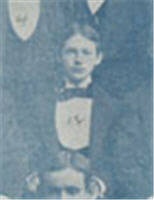 There has long been little publicly available information about Randolph, aside from a mention in Philip Bruce’s 1921 five volume history of the University of Virginia and his presence in the archival 1893 Glee Club photo that also features the author of the “Good Old Song.” The liner notes to the Club’s 1972 recording A Shadow’s on the Sundial place him as the organist at the University Chapel, but otherwise he seemed doomed to fade into obscurity. However, when I did a news timeline search for “virginia glee club”, I turned up some hits in the 1890s that I hadn’t seen before. In particular, one 1894 report in the Atlanta Constitution gave me quite a bit more information about Randolph and the boys of the Glee Club than I had seen previously. In this case, the description of Randolph as an “instructor of mathematics” made me go back and look deeper into his biography, and I turned up a fuller biography of him in a 1920-era volume that says that he left Virginia in 1895 to go to the University of Arkansas, and then in 1897 to the presidency of the College of Charleston, where he spent nearly the next 50 years. It appears, despite his accomplishments, that the directorship of the Glee Club was not then without its perils; the Constitution gives a glowing description of his intellect, then drily notes, “To him has been allotted the awful task of directing the Glee Club.” Even allowing for the “amazing,” “awe-inspiring” sense of the word, one still feels the pressure of the world on Randolph’s young shoulders, particularly looking back at his 1893 photograph. Born the same year as the Glee Club itself, he looks at the age of 22 smaller and more exhausted than those around him in the publicity photo. Is it any wonder that only two short years later he fled to the relatively safer world of academia? For those with patience, I’ve added the text of the original 1894 concert review article; it provides a rare glimpse at the mechanics of how the Glee, Banjo, and Mandolin clubs worked together and gives thumbnail biographies of each member.